Sciatica is becoming a common issue for many adults, but just because it’s common does not mean that it’s normal. Before trying to deal with sciatica on our own, be sure to consult you Chiropractor, who can help get to the root cause of where the sciatica is stemming from. Often times the root cause ends up coming from the nerve roots in the low back, typically from repetitive stress of sitting and other causes. IMPORTANT NOTE: These stretches are not a method to cure sciatica, these stretches help support corrective adjustments, to facilitate the healing process and removing any unnecessary stress and tension from the lower back. Consult with your Chiropractic Doctor to determine the cause behind your sciatica. This will hopefully become a tool for you as you go through your corrective care process to speed up your recovery and allow your adjustments to set better. You may choose to either lie on the ground or stay upright. I suggest using a towel or band to wrap around the ball of your foot to increase the stretch. Bring leg up or prop leg on a chair or couch and lean forward while pulling on the towel or band. IMPORTANT TIPS: Keep a straight spine the entire time. The goal is to stretch the hamstring, not to see if you can touch your toes. There’s a difference! The key is to lean into the stretch and use the band to increase the stretch. Yes, you may feel this in the calf. There is a band of tissue called fascia connected your glutes, hamstrings, and calves together. Time: Hold for 30 seconds each side, remembering to breath deeply throughout the stretch. As you breathe out, increase the stretch as you feel comfortable. The goal of this stretch is to release the tension in the glute muscles. Lie flat on your back, bringing your knee to your chest using your hands. Keep the other leg straight and flat on the floor. Time: Hold for 30 seconds each side, remembering to breathe deeply throughout the stretch. The goal of this stretch is to release as much tension as possible from the muscles of the low back. If you are under corrective care it’s important not to “force” this stretch. Lie on your back with outstretched arms out to the side. 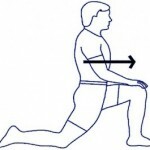 Bend one knee and raise it to your chest, then let your knee fall to the opposite side of your body towards the floor. You may use the arm of the opposite side (as seen in the picture) to increase in the picture above. IMPORTANT TIPS: It’s crucial to keep your upper back as flat onto the floor as possible. This helps focus the stretch into the low back. The hip flexors attach directly to the lumbar spine. As they get tight they can pull on the low back and add tension and stress to the spine and therefore nervous system. The first step is to bend down into a seated lung position with one knee bent on the floor, while the other knee is bent with your foot on the floor (as seen in the picture). Keep the foot (on the down knee) flat and stretched out on the floor (as seen in the picture). Initiate the stretch by moving your body forward, feeling the stretch in the groin. IMPORTANT TIPS: Keep spine straight throughout the stretch while engaging your core as you move your body forward. Keep your chest up. The key is to move your pelvis forward and deeper into the stretch. The most important part to make this stretch effective is to keep your core tight and engaged, not letting your low back round as you stretch. Time: Hold for 30 seconds each side, remembering to breathe, while keeping the core engaged. You can perform this stretch while seated. Bring one foot up to rest above your knee. Your leg does not have to be parallel to the floor for the stretch to be effective. To initiate the stretch, lean your body forward, remembering to keep your chest up and spine straight. Feel the stretch in your bottom by your gluten and hips. To increase the stretch lean back, use your hands to place downward pressure on your raised knee, then re-engage the stretch. You should feel an increase in the stretch and will not be able to lean as far. IMPORTANT TIPS: Make sure to keep a straight spine by keeping the chest up. Only place downward pressure on the knee through the stretch if you are flexible and you are not feeling a stretch. Time: Hold for 30 seconds each side, remembering to breathe deeply into the stretch. The child’s pose stretch may not seem like a stretch effective for sciatica, but it is incredibly effective at removing tension from muscles pulling on the spine. The stretch can help reduce some of the stress on the low back.To begin the stretch, start with both knees on the floor. Lean your body forward placing hands on the floor and push your hips back towards feet. Allow your head and chest to drop towards the floor. See the picture for positioning. IMPORTANT TIPS: If you have knee trouble, the stretch can be performed while standing and using a table to place your hands up, slightly bending the knees, and pushing the hips back. It’s very important to breathe deeply into this stretch. Time: Hold for 1 minute or more as you feel comfortable, remembering to breathe deeply into the stretch.